A team led by Dr Chris Subbe, Senior Lecturer, School of Medical Sciences at Bangor University and a practicing clinician at Betsi Cadwaladr University Health Board has been awarded the MediWales Award for "NHS Partnership with UK and International Industry" sponsored by Health & Care Research Wales and Roche. With Chris Subbe, (centre) at the Award ceremony are team members Peter Howell (Roche UK), Andrew Goodall (CEO NHS Wales), Jürgen Fischbach (Philips R&D), Jose Fortino (Philips UK) The award was won for a collaboration with Philips Healthcare. Philips, a market leader in Intensive Care Monitoring came to North Wales to test their most advanced monitoring system for general wards as part of the VITAL II study. North Wales has been one of the leading centres for hospital safety for the last 15 years with work on Rapid Response Systems. Rapid Response Systems use systematic evaluation of patient’s vital signs (respiratory rate, blood pressure, heart rate). If a patients vital sign pattern indicates deterioration a Rapid Response Team is called to the bedside (usually by phone) to support patients at risk. "The 'Guardian solution' enhances patient safety by introducing two novel elements: The use of clear icons that are displayed at the central nursing station makes it obvious for all members of a team that patient is not well, not just for the member of the nursing team that is looking after the patient. Guarding also automatically notifies the Rapid Response Team of abnormal vital signs." Preliminary results suggest a reduction of cardiac arrests and earlier transfer of critically ill patients to the safety of the Intensive Care. The system brings a step-change in patient safety by using principles that have been common practice in airline safety: simplifying procedures for nurses and doctors frees up capacity to improve treatment of patients. Additionally the electronic system serves as an additional safety net. 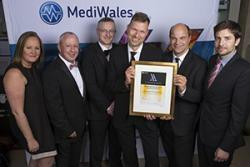 This is the second year running Dr Subbe has been part of an award winning team at MediWales. He was awarded the Innovation within the NHS Award last year for his work with Andy Goodman Pontio Innovation at Bangor University for the design of a pilot medical record that patients can create themselves. Prof. Dean Williams, Head of Medical Sciences said, "This research typifies both the high quality and real world impact of the research that Bangor University and Betsi Cadwaladr University Health Board is undertaking in partnership with some of the worlds biggest commercial players in the Health and Medical field." Prof. Nicky Callow, Dean of the College of Health and Behavioural Sciences added, "We are delighted that Chris Subbe's research had been recognised for the second year running. It is testament to the quality of his research, the positive benefit it can have for patient care, and in this case, the partnership on an International stage with industry."